The Neovasc Reducer was successfully implanted in a middle-aged, Detroit-area man on June 19. Henry Ford Health System cardiologist Gerald Koenig led the procedure, with support from cardiologists Ryan Gindi and Janakkumar Kansagra, and cardiac electrophysiologist Claudio Schuger. 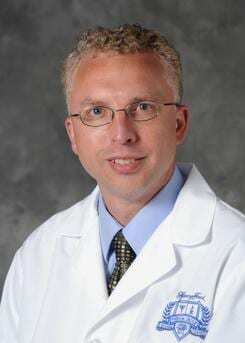 "Angina affects millions of people in the United States," said Dr. Koenig, research director for the Cardiac Catheterization Laboratory at Henry Ford Hospital and catheterization lab medical director at Henry Ford West Bloomfield Hospital. "Unfortunately, bypass and medical intervention provides little relief to some. So we are hopeful that this procedure can be of some benefit." The "reducer" is a stainless steel, hourglass-shaped mesh that is 3 millimeters in diameter at its smallest point. Through a catheter inserted in the patient's groin area, the reducer is placed inside the heart in a minimally invasive procedure similar to implanting a coronary stent. The procedure typically takes about 20 minutes. Within six to eight weeks, tissue then grows over the mesh, narrowing the passageway. The procedure attempts to address angina by creating a backflow pressure into the heart by narrowing the area of the heart where blood flows out, the coronary sinus. That backflow pressure pushes blood into areas that need additional oxygenation. "They saw a dramatic improvement in a vast majority of patients," Dr. Koenig said. "Seventy percent of patients had some relief of their angina." Prior to the Henry Ford patient's procedure in June, he told his doctors he could walk about two blocks before experiencing angina, which he rated a 7-8/10 on a pain scale. He also used nitroglycerin two to three times per week to alleviate symptoms. At an Aug. 12 follow-up appointment 12 weeks after the procedure, he reported walking several miles without any symptoms and taking nitroglycerin one or two times per month. He said he was rarely experiencing chest discomfort, and any chest pain was rated at a 3/4. In the case of the Henry Ford Hospital patient, Henry Ford administration and the U.S. Food & Drug Administration (FDA) permitted the device to be used as a "compassionate use" case. In those situations, there are no other medically viable, commercially approved options available for the patient. "We participate in trials and strive to work with patients who have been told they are out of options," said cardiologist Henry Kim, medical director of the Edith and Benson Ford Heart & Vascular Institute at Henry Ford Health System. "At Henry Ford, we're continually working to advanced science in the field of cardiology to provide the best care available to our patients." To make an appointment with a Henry Ford cardiologist, call 844-725-6424 or visit http://www.HenryFord.com/hvi. To take an online heart quiz to check your own cardiovascular health, please visit http://www.HenryFord.com/hearthealth.